Al Green talks to God. That’s not meant as metaphor or a figure of speech. Al Green literally talks to God. 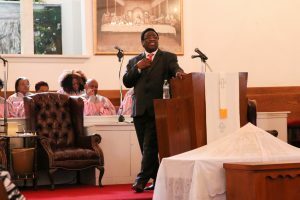 He banters, chatters, laughs, argues, questions, sings to and speaks with the Almighty on a regular basis — whether lying in bed, driving his car, sitting in his office or preaching in the pulpit. It’s a running conversation that began in the early 1970s, and has continued unabated for the past five decades. “I’m talking all the time, back and forth, talking all the time, back and forth,” says Green, the pastor of Memphis’ Full Gospel Tabernacle church and one of the most famous soul singers in the world. Green has not been in the studio proper in the eight years since. But week after week (most of them, anyway) he can be found leading services at his Full Gospel Tabernacle. The church’s congregation is spirited, if relatively small — but it swells with the tourist season, as fans and curious visitors come from all over to see Green preach and sing.